Episode 8 of the Birkie Web Today Podcast has been published. In this episode, fellow Birkie Buddy, Mike Tarnow, and I interview Nathan Schultz and Zack Caldwell with Boulder Nordic Sport of Boulder, Colorado and Portland, Maine as well as provide news & information about the American Birkebeiner Ski Race and Nordic skiing. Boulder Nordic Sport, which started in 2006 is dedicated to bringing world class Nordic services to all skiers. Their shop in Portland, Maine opened in 2009. Nathan Schultz began skiing in high school where he finished dead last in every race. His friends’ enthusiasm for the sport was contagious, however, and kept him going long enough to ski at the University of Colorado, where he was a two-time NCAA All-American, Team Captain and 1994 Scholar Athlete of the Year. He went on to a 15-year professional career with the Subaru Factory and Fischer/Swix Teams, while also building a software consulting business and racing mountain bikes professionally, from 1995-1999. He launched Boulder Nordic Sport in October, 2006. Zach Caldwell graduated from Middlebury College in 1994 where he was twice captain of the Nordic Team. 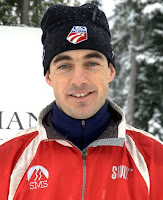 He began work for the fledgling New England Nordic Ski Association and grew the association for six years, working on regional development programs and coaches education tools. In 2001 he left to start Engineered Tuning – an elite Nordic grinding service that has evolved through time and has now been wholly absorbed by Boulder Nordic Sports. Zach spent the last two years testing grinds at the Callaghan Valley Olympic venue for the US Ski Team as part of their Olympic Development program. In addition to working with skis, Zach works as a personal coach with a small number of high level American and Canadian athletes including Kris Freeman. 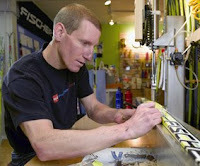 Zach is leading Bolder Nordic Sports’s efforts in ski selection, grind development and waxing. Zach lives with his wife and their son in Boulder, Co.